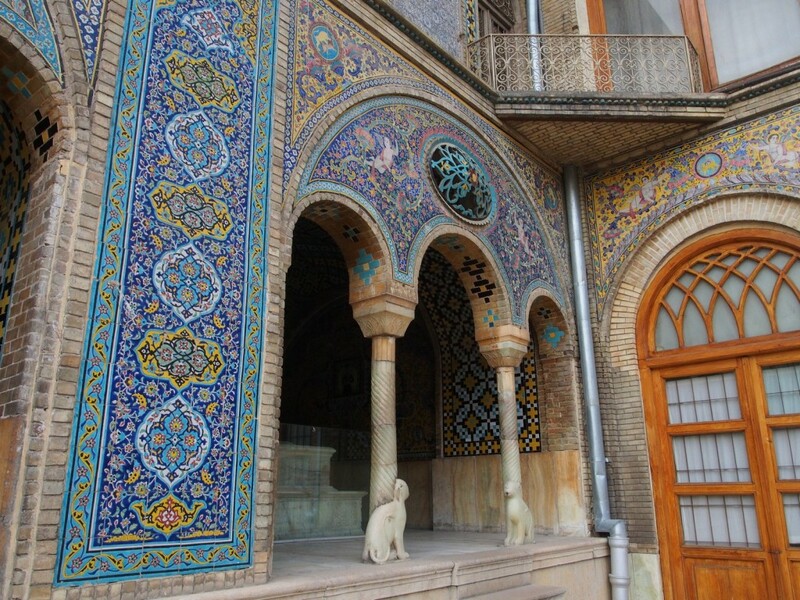 Tehran, the capital of Iran, is a huge, bustling modern city. 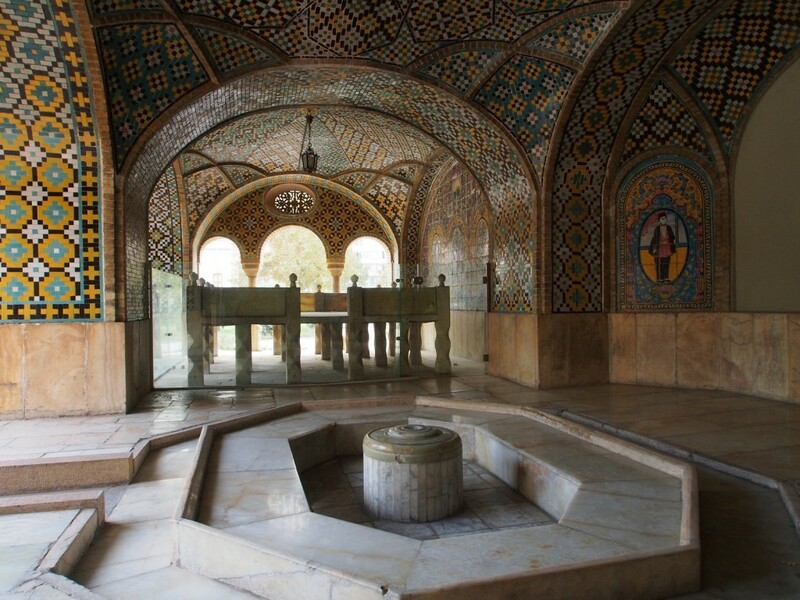 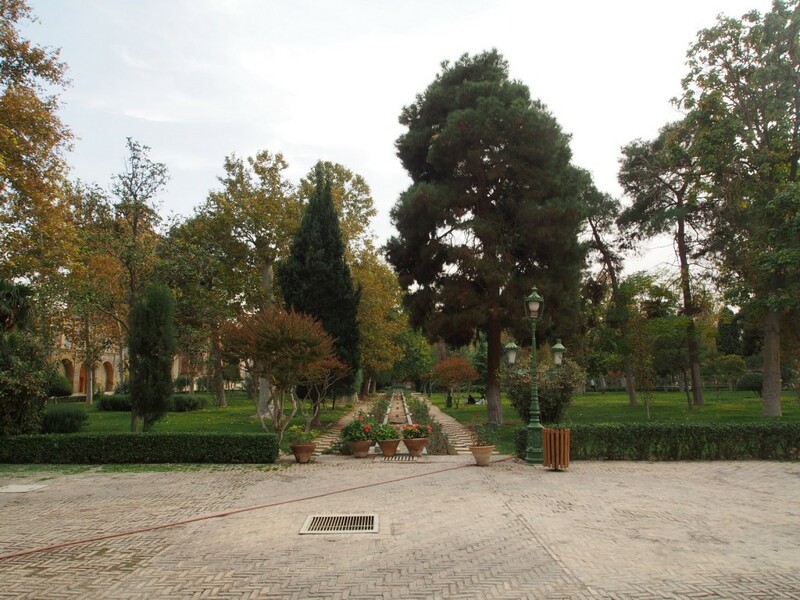 It lacks much of the ancient history of Shiraz or Isfahan, but makes up for it with a depth of history from the 18th Century onwards, and as the centre of the modern-day Islamic Republic. 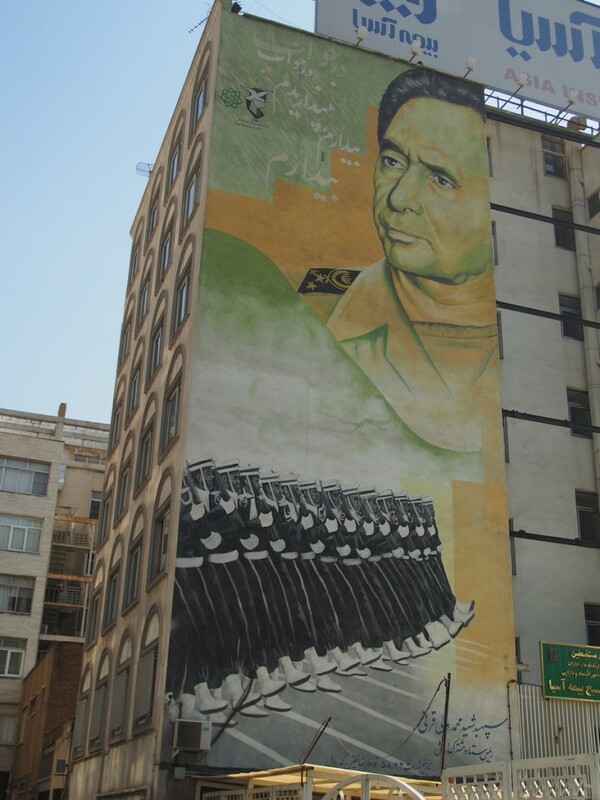 The first thing you notice when walking around the town are the huge pro-revolutionary murals on the sides of buildings. 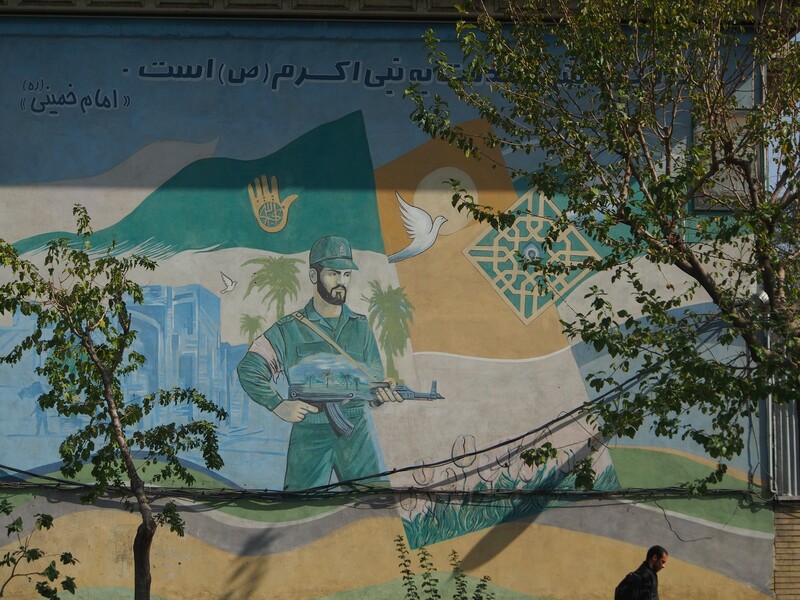 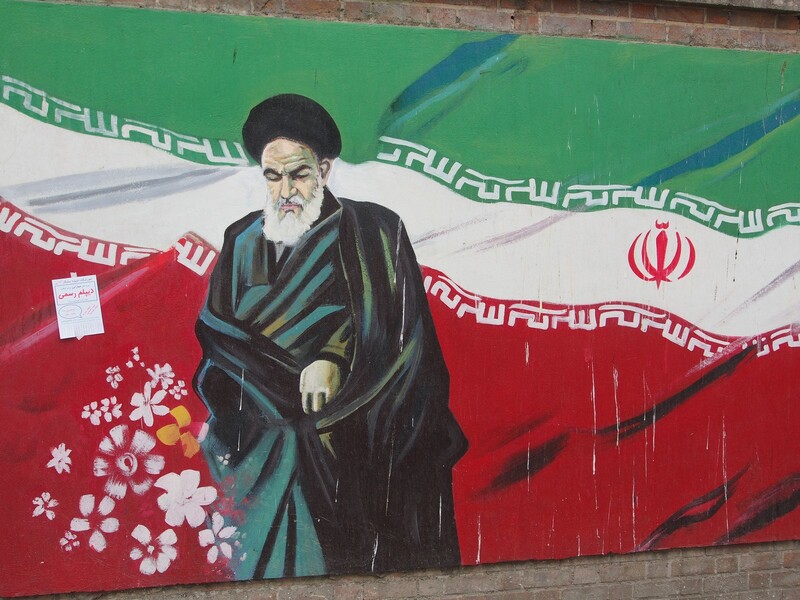 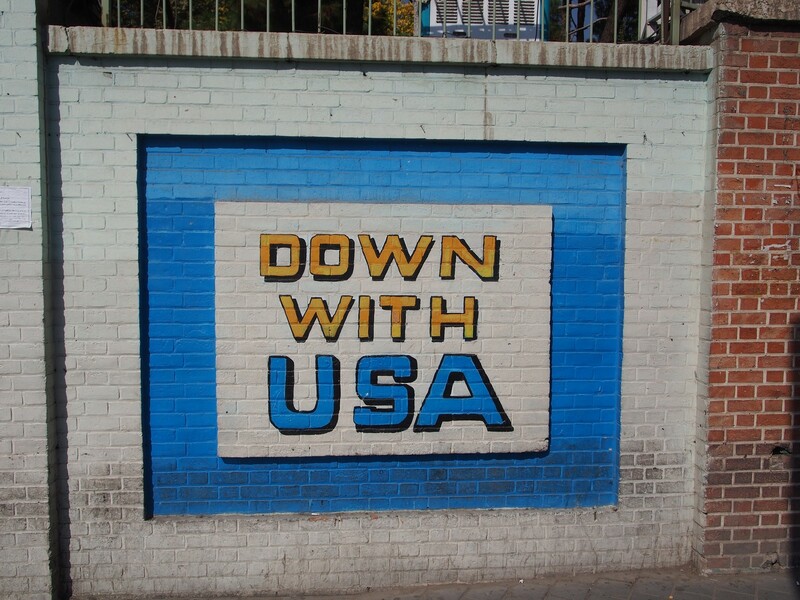 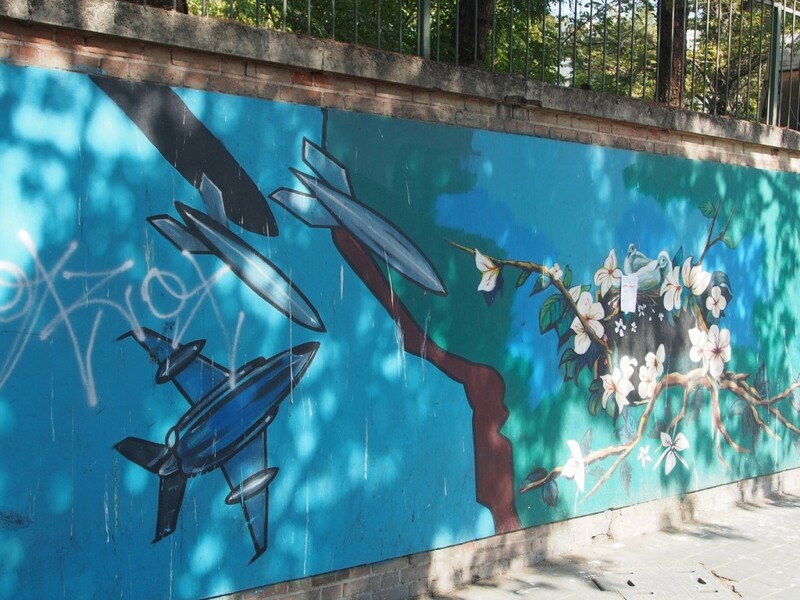 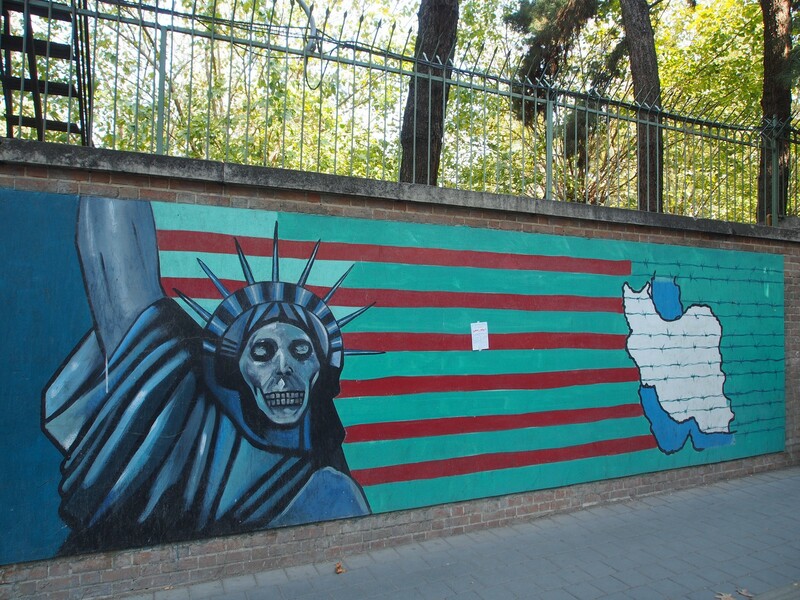 The most interesting of these are painted on the walls surrounding the old US Embassy – locally known as the “Den of Spies”, where most of the embassy staff were held hostage for over a year in the aftermath of the revolution. 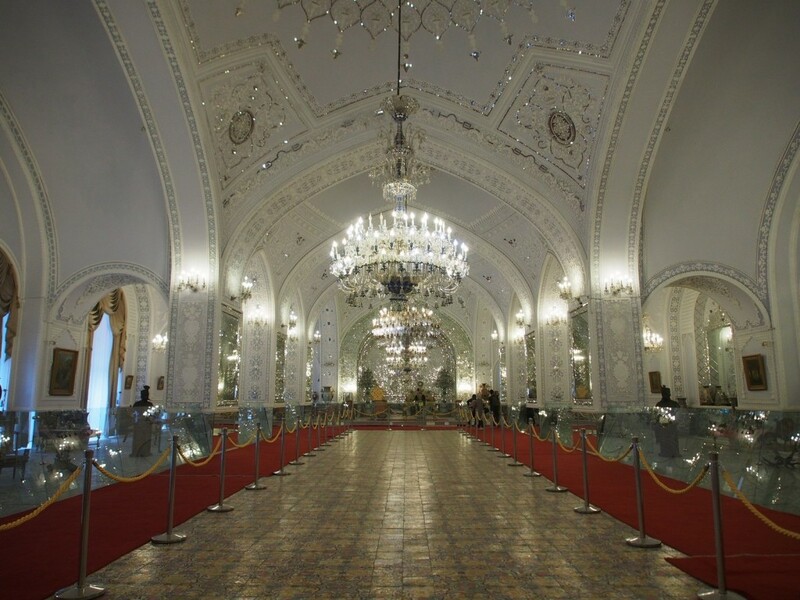 Access inside is forbidden, and even taking photos of the murals is frequently frowned upon – although we didn’t have any problems. 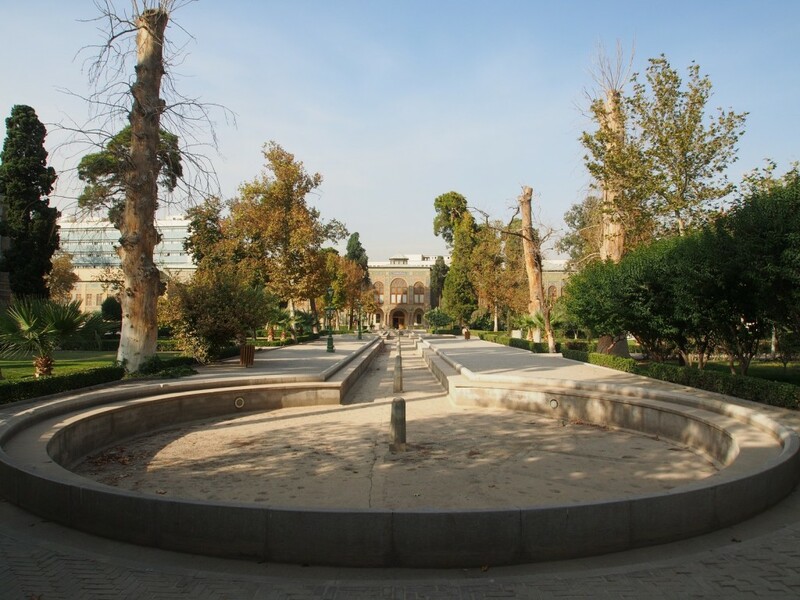 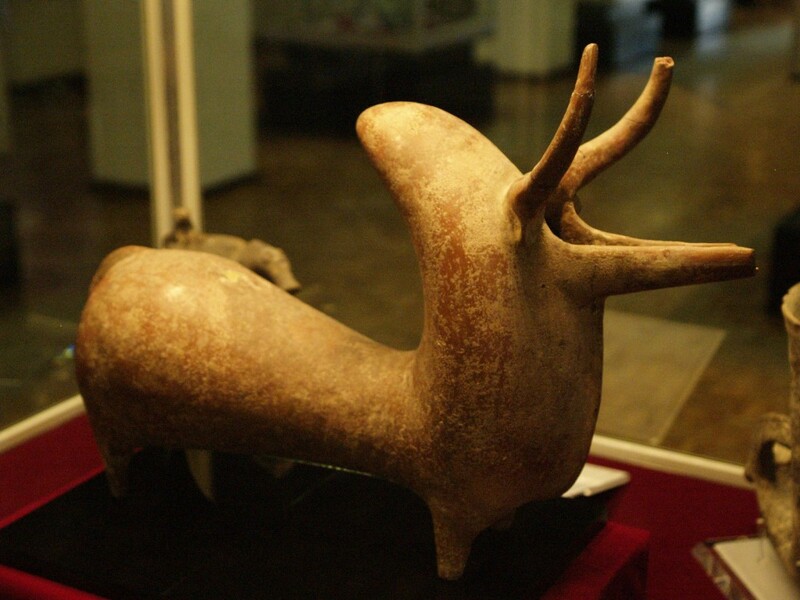 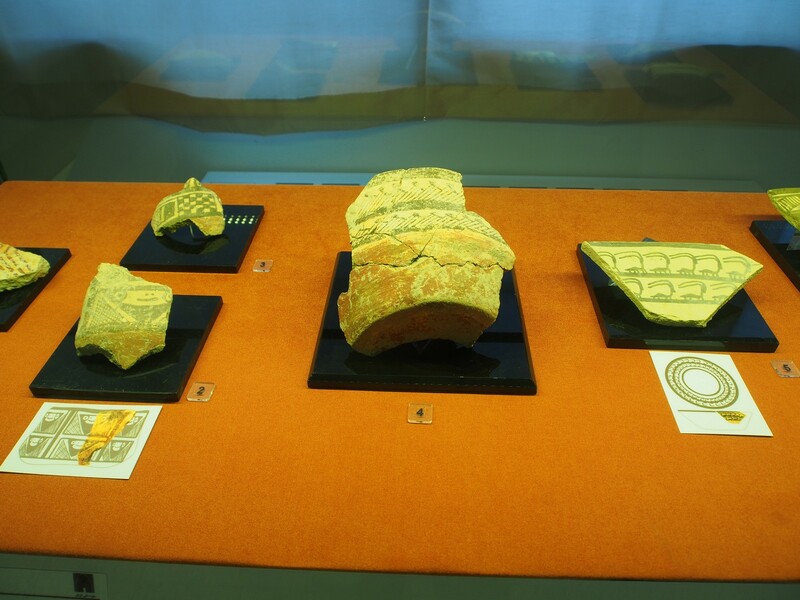 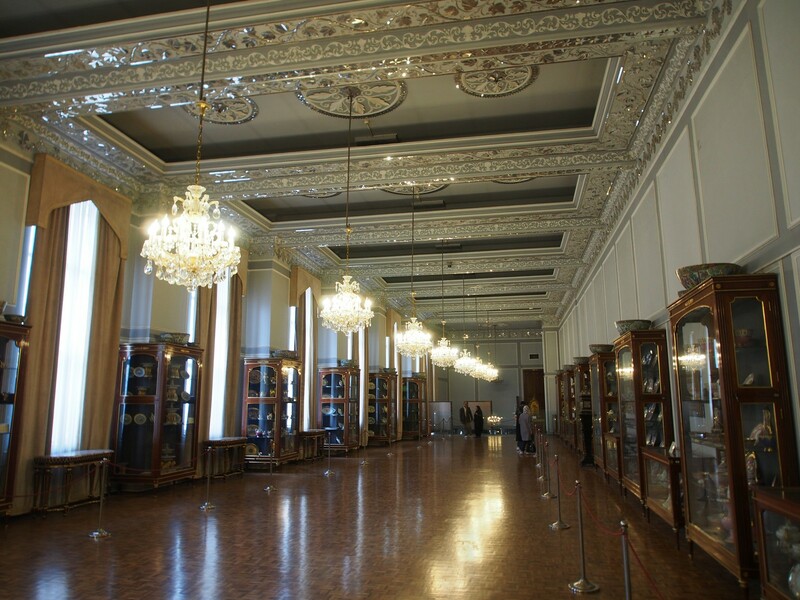 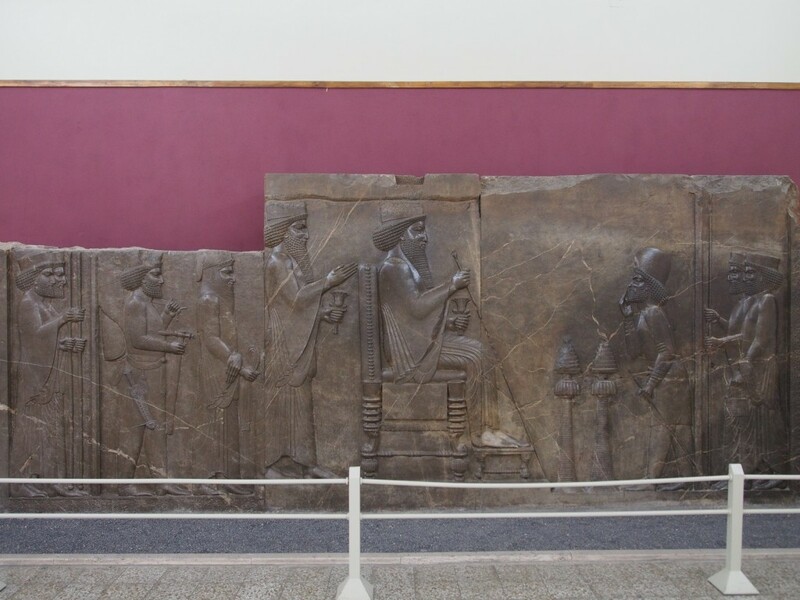 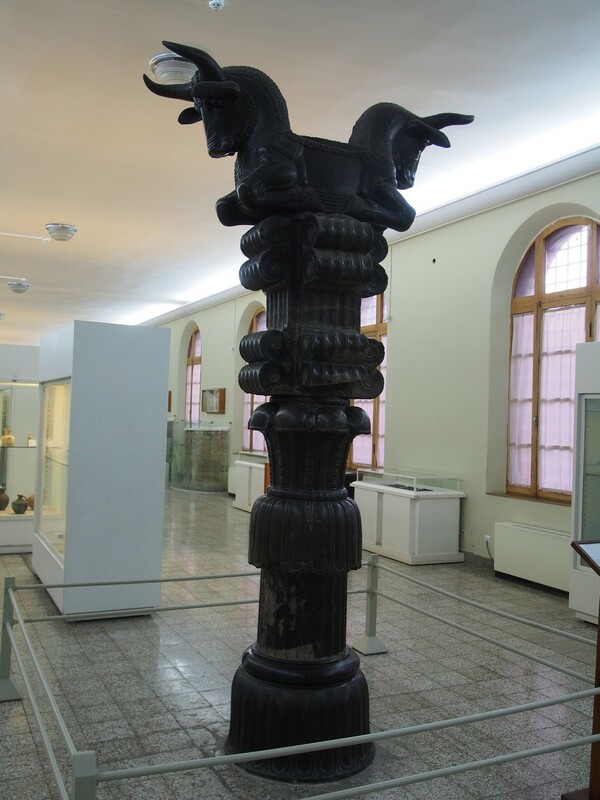 Considering the relative lack of historical significance of Tehran (it only rose to prominence in the late 18th Century), one of the best sights is the National Museum, containing many treasures dating back to prehistory and through the many empires and ages of Persia. 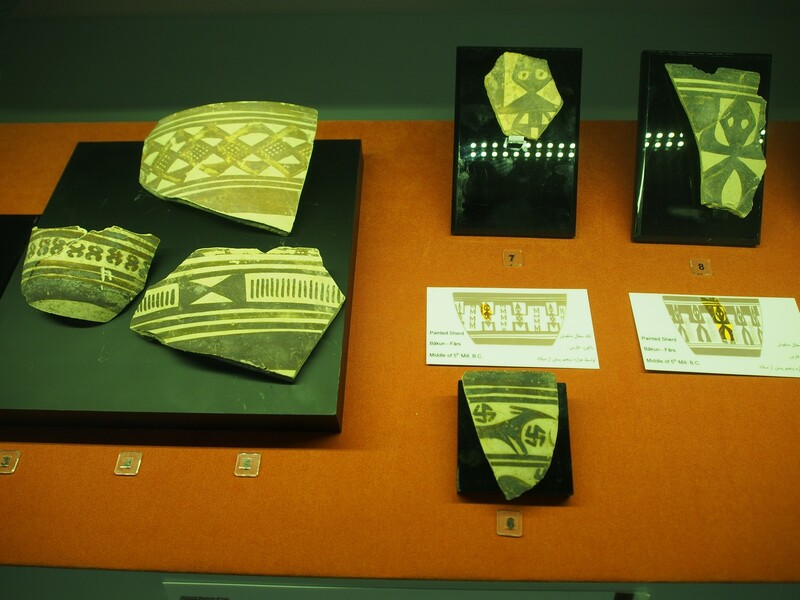 Some of the pottery is more than 7,000 years old. 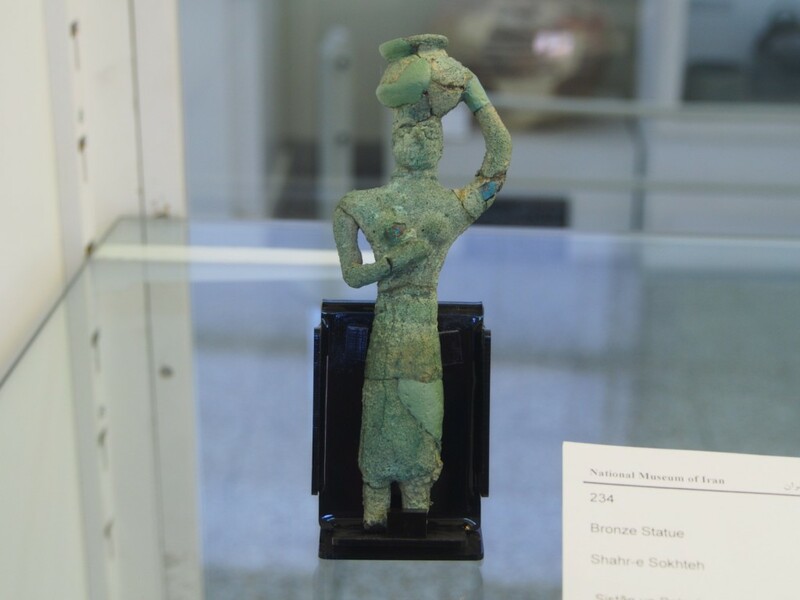 The ancient bronze artefacts are even more finely detailed, considering they’re over 5,000 years old. 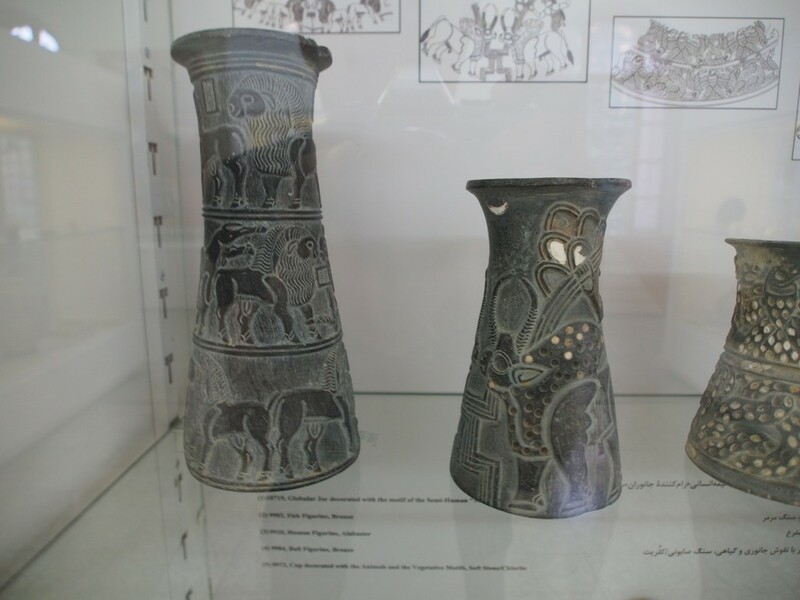 But the most impressive are those taken from Persepolis and other Achaemenid sites. 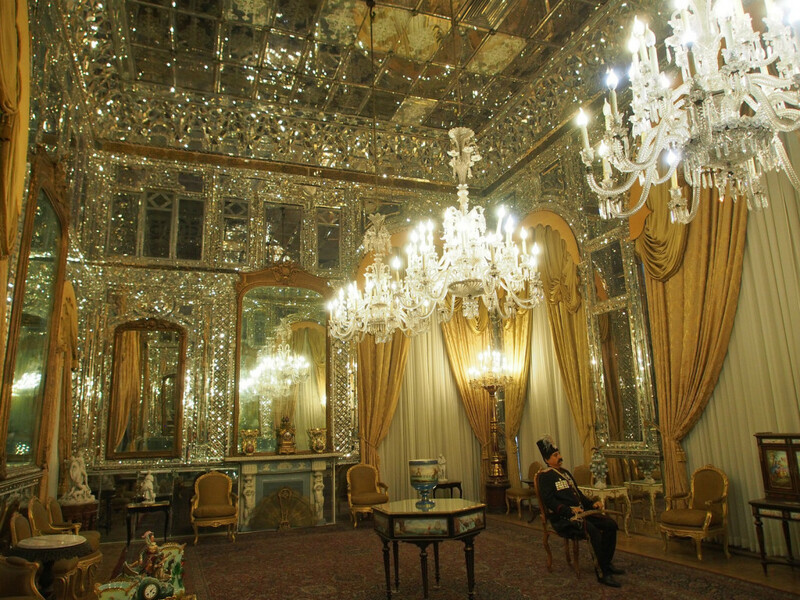 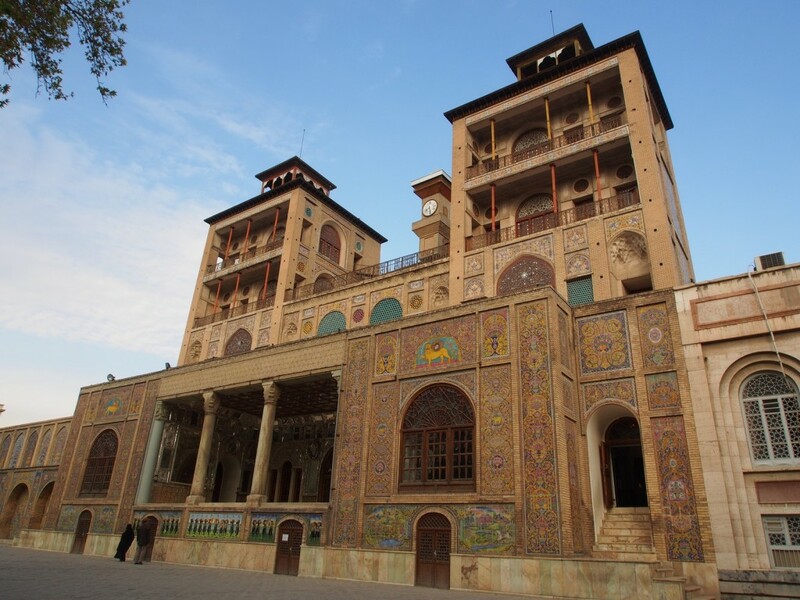 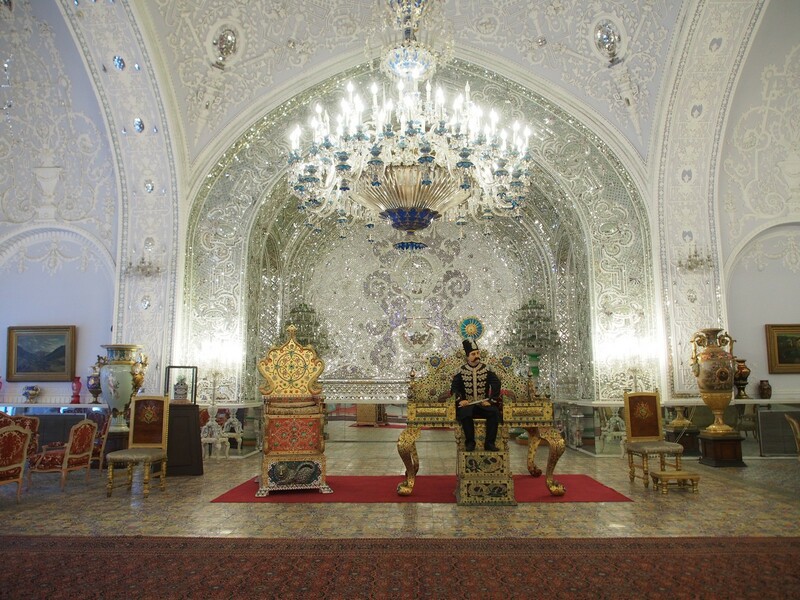 The largest historical sight in the city itself is the Golestan Palace, the seat of the Qajar dynasty from the late 18th Century through until 1925. 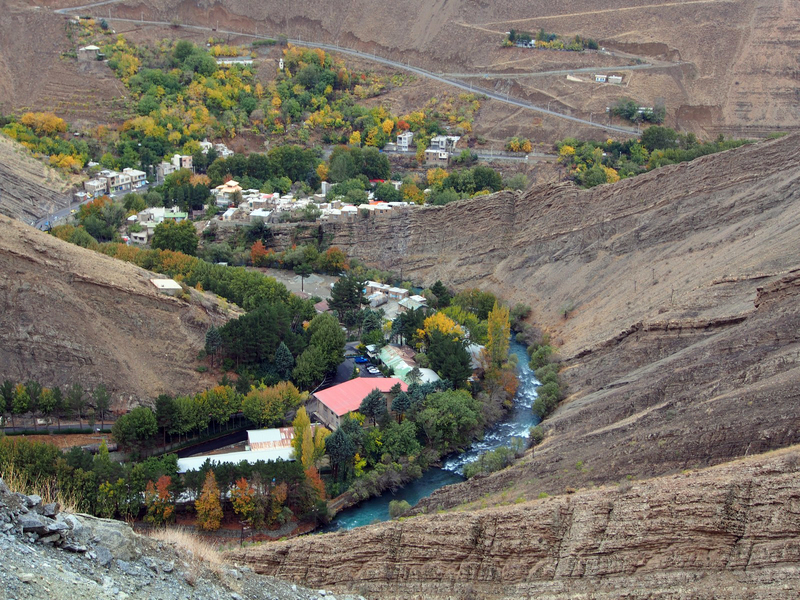 It used to form part of the walled administrative and political district, the Arg, but much was knocked down in the mid-20th Century in the name of progress. 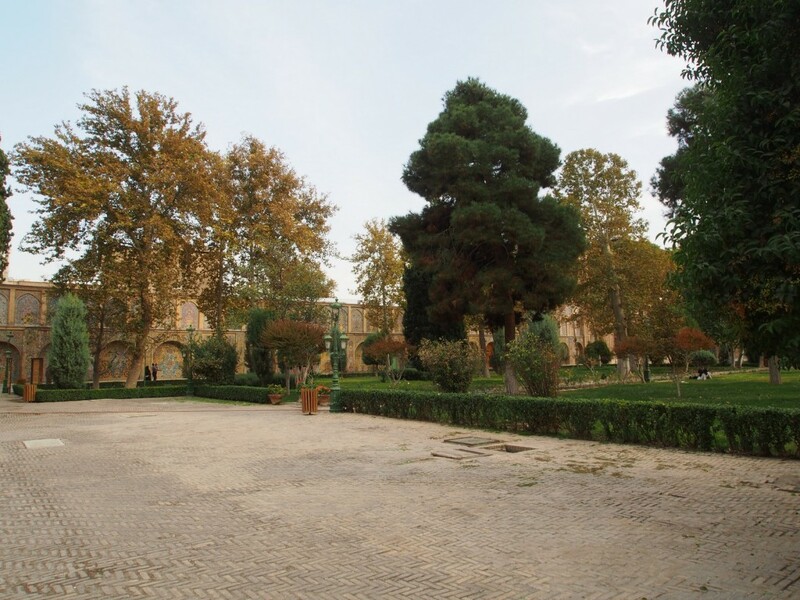 The palace itself is a ring of buildings and walls around a central garden. 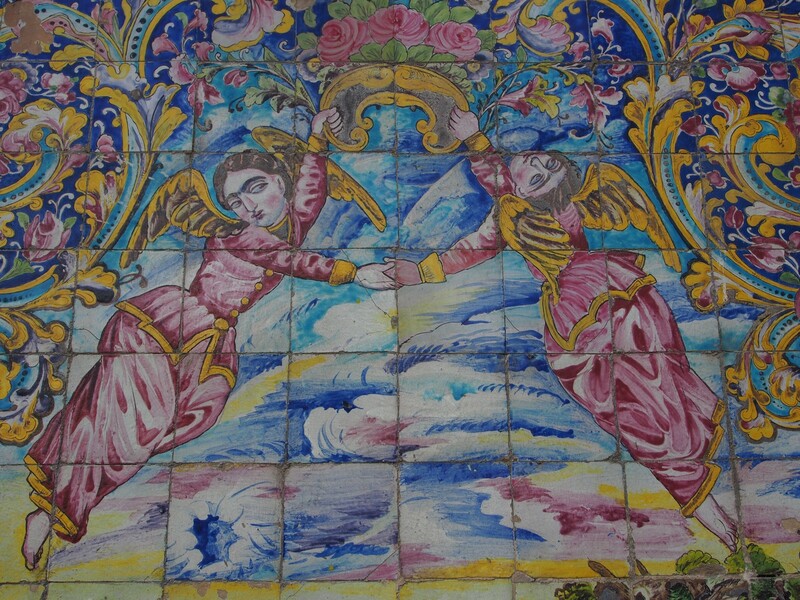 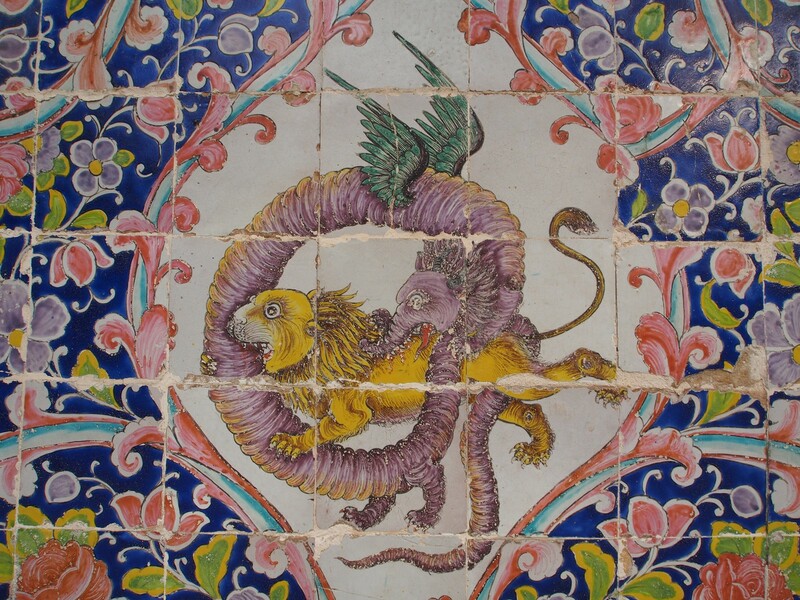 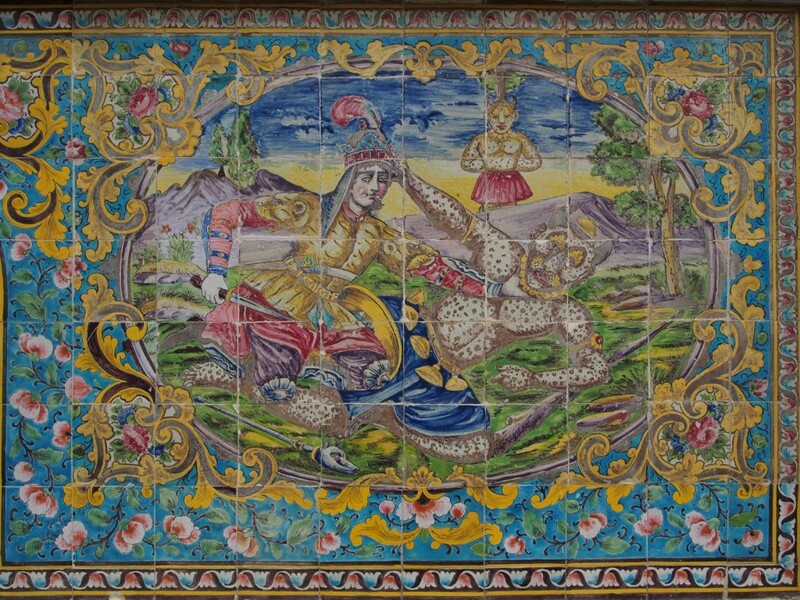 The palace walls are decorated with painted tile frescoes, some with hilariously inept painting. 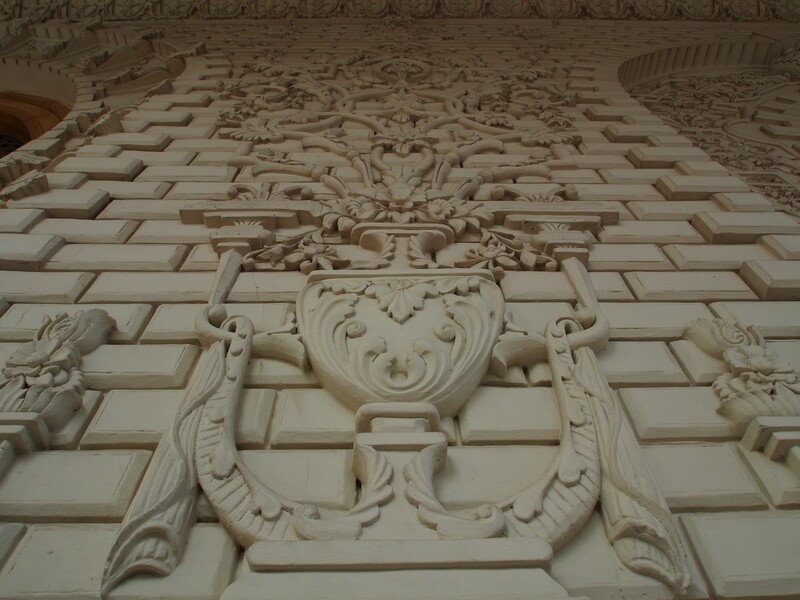 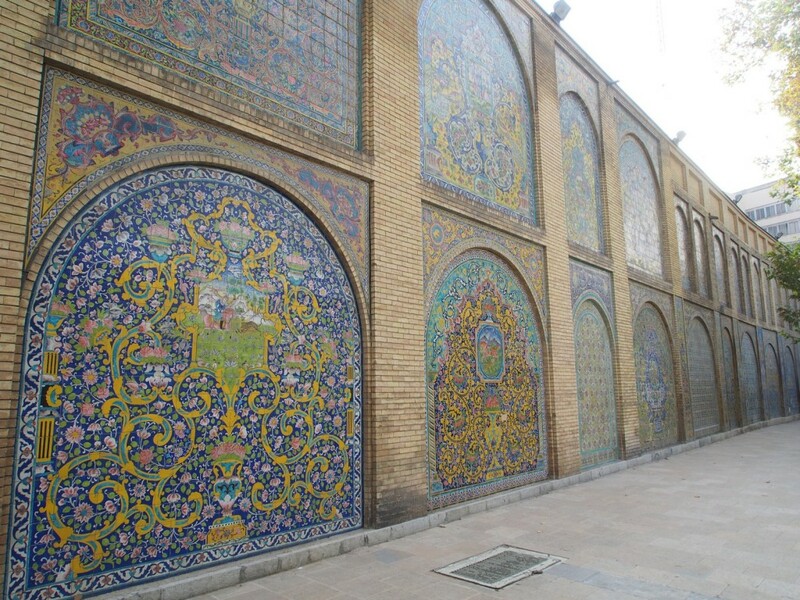 The exteriors of the buildings ramped the decorations up, with mirror mosaics featuring heavily. 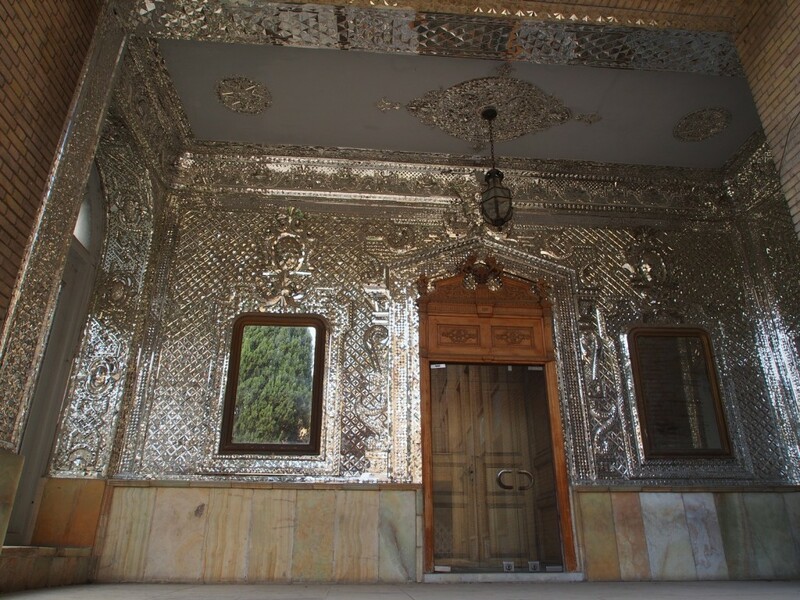 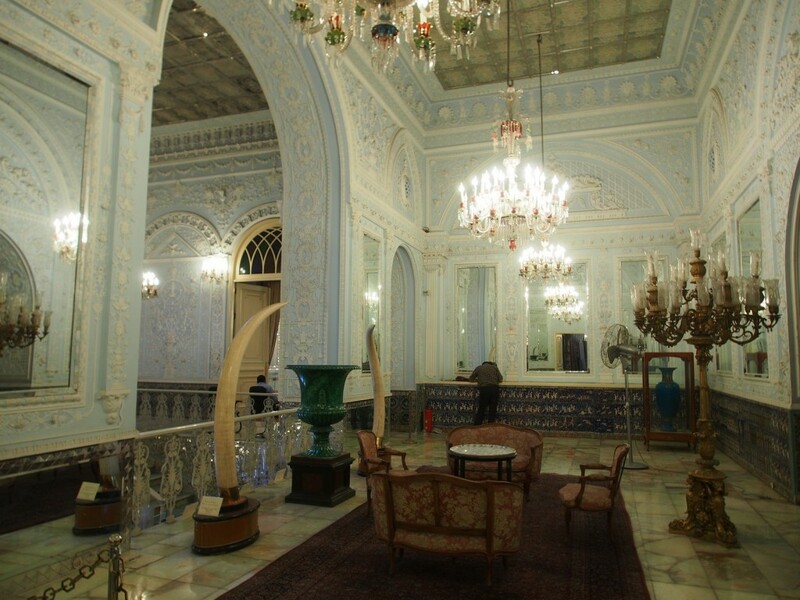 The main reception hall, the Talar-e-Salam, takes the mirror mosaics to the next level, while also combining many features popular in European palaces. 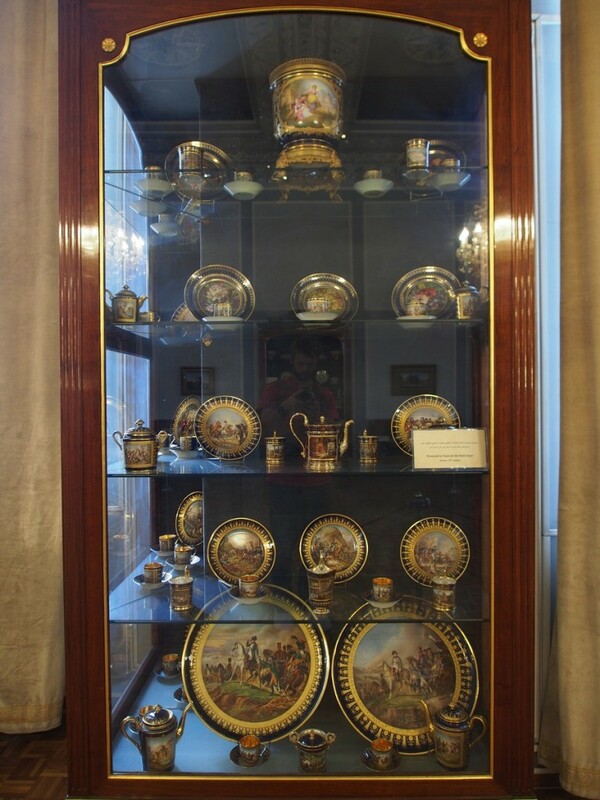 A range of gifts from various other world leaders are on display – including a porcelain dinner set from Napoleon, painted with all his military victories. 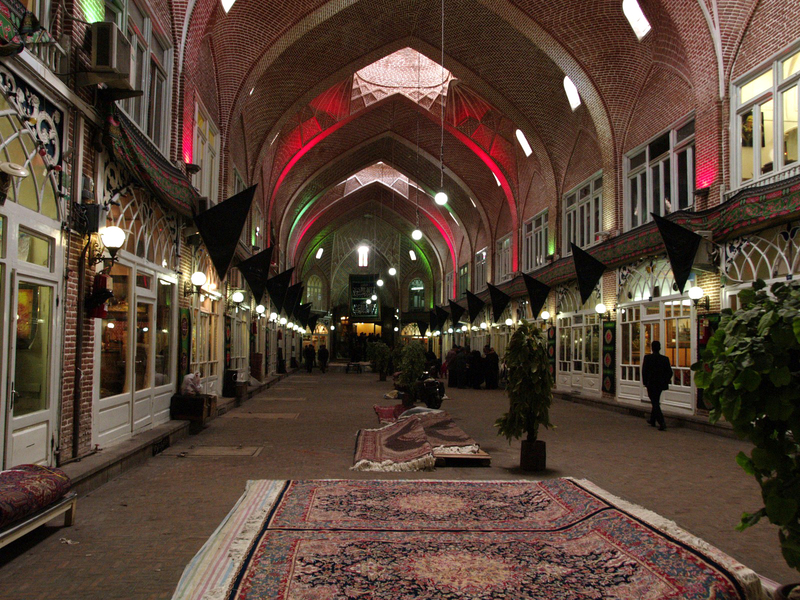 Nearby the palace, the winding alleys of the city bazaar begin – and twist and turn for kilometres. 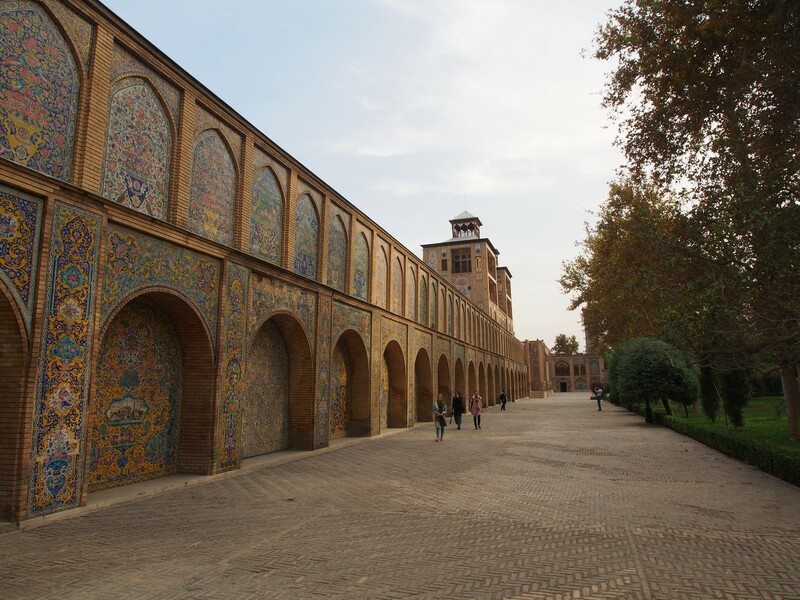 While in other cities it’s fairly linear, here it’s a densely packed maze that loops back on itself many times. 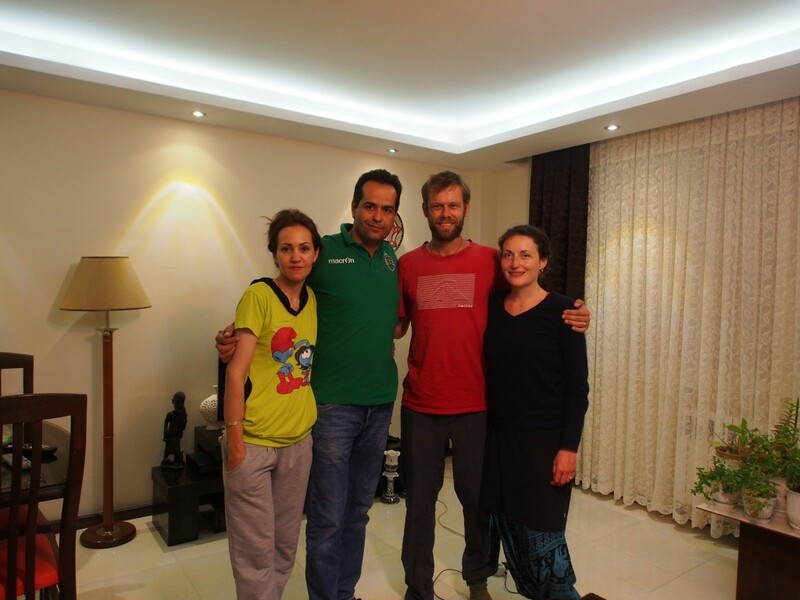 I’d like to give a massive thanks to Reza and Mahdieh, our hosts in Tehran. 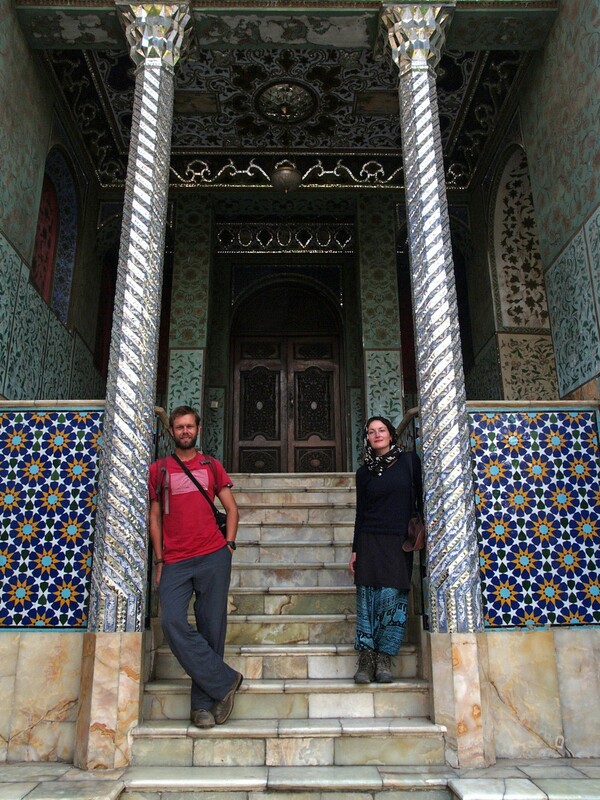 They took us in, fed us, showed us around town, and were generally awesome. 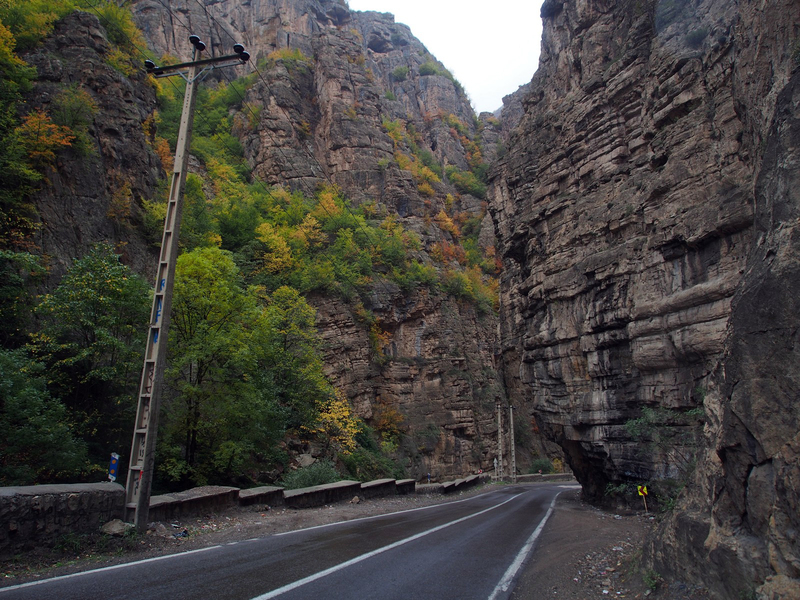 Our plan from here was to head north over the mountains to the Caspian Sea and follow the coast for a while. 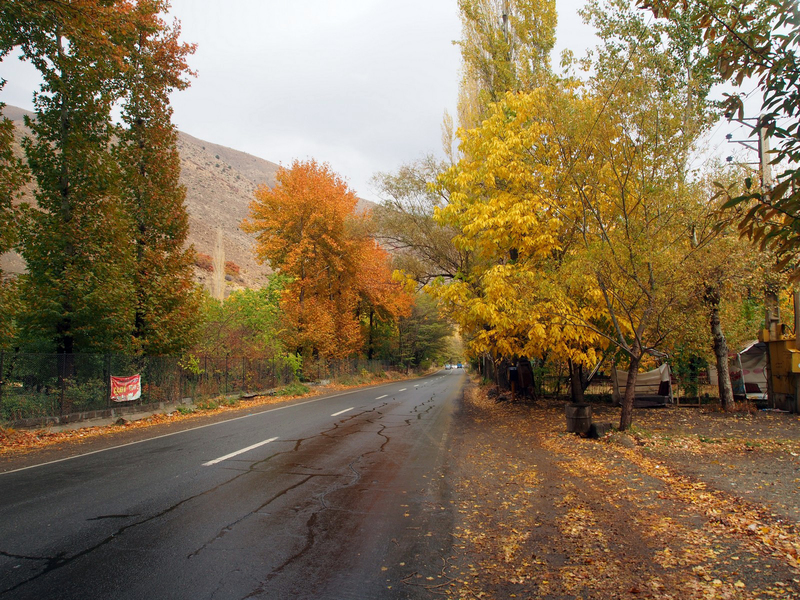 Initially, the road was great, passing through the autumn-coloured landscape. 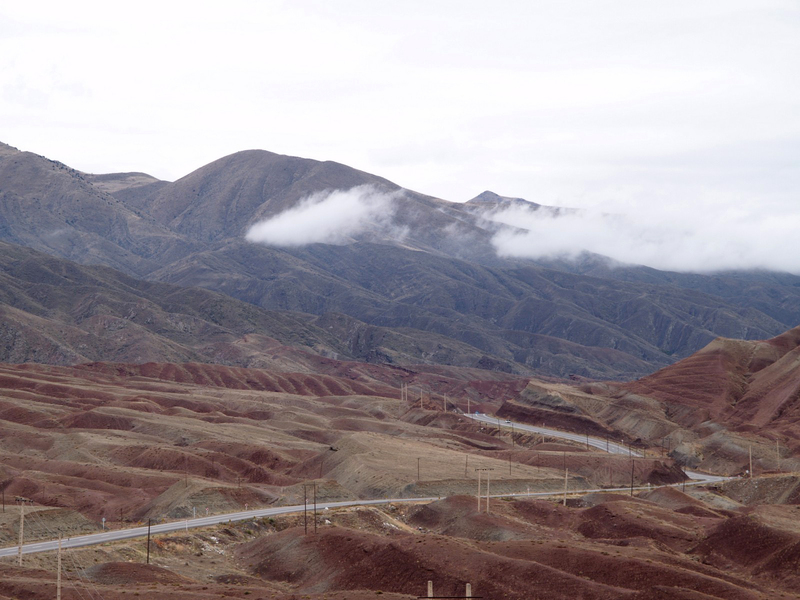 As we descended back down the mountains to the coast, however, mist rolled in and the rain started. 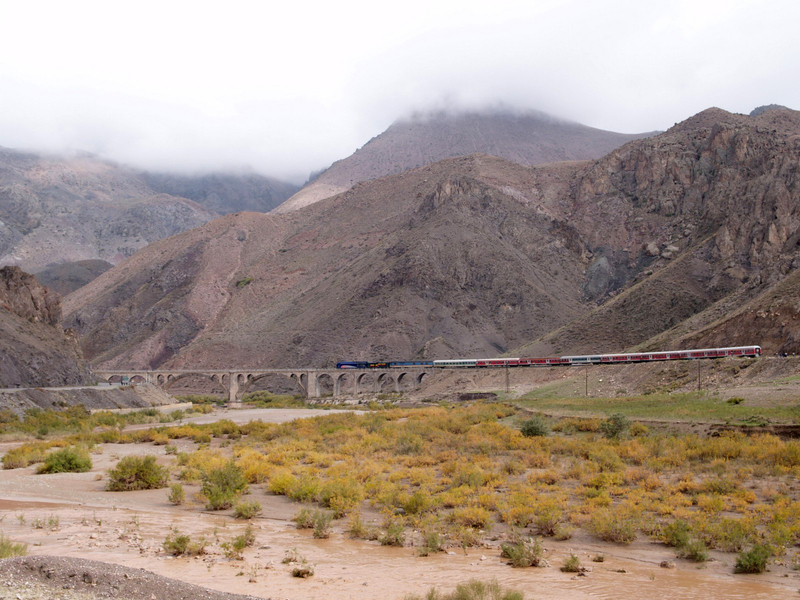 And kept going. 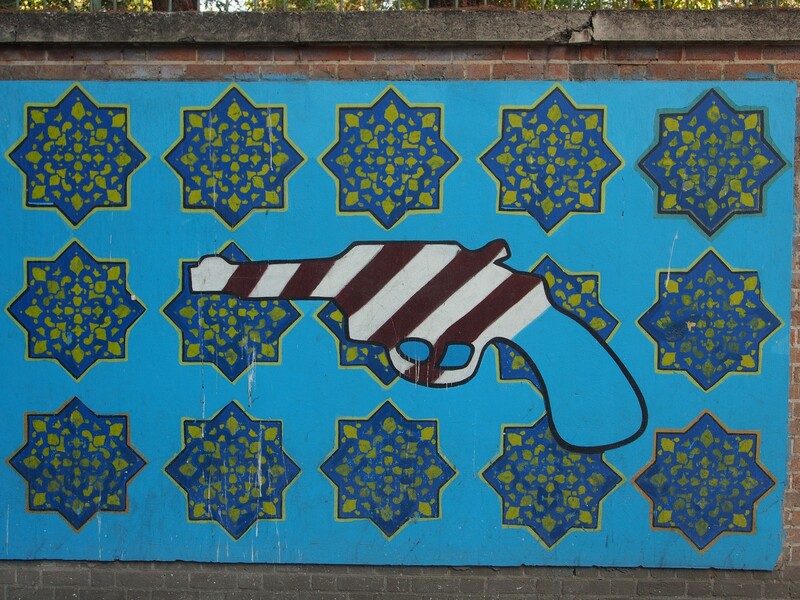 For four days. 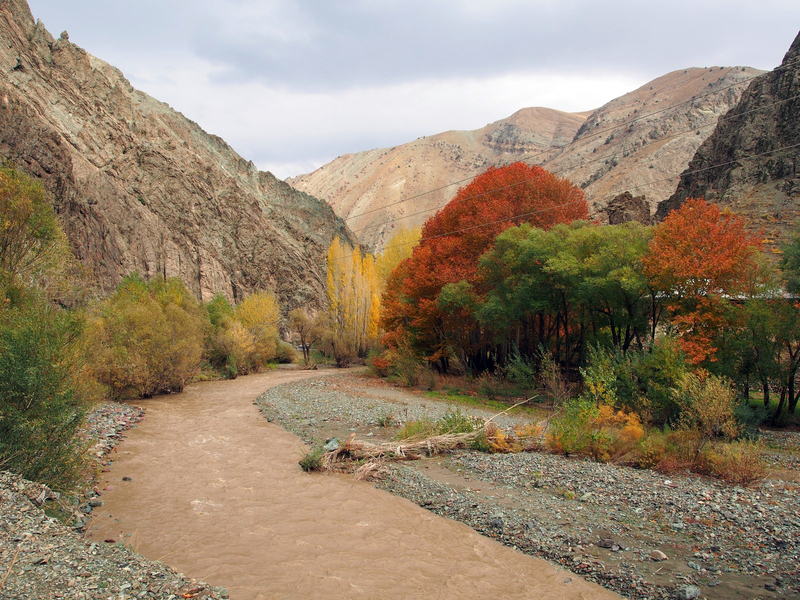 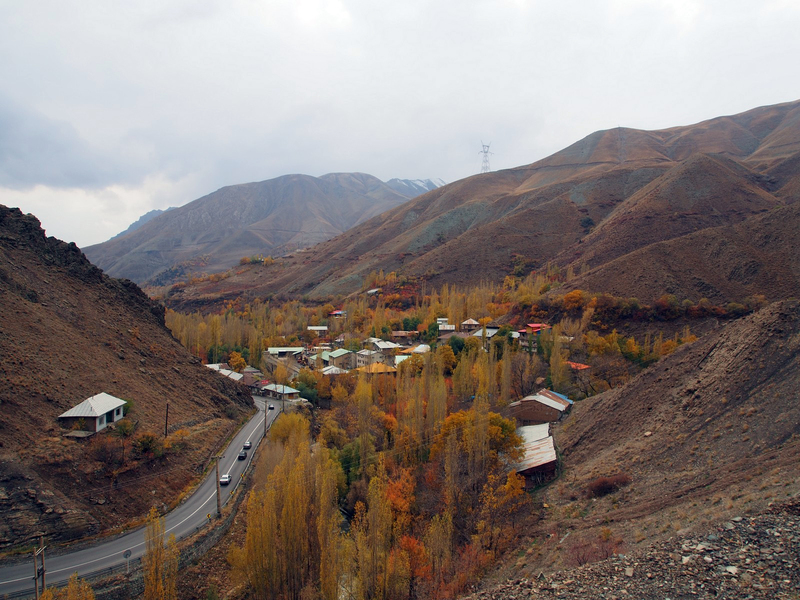 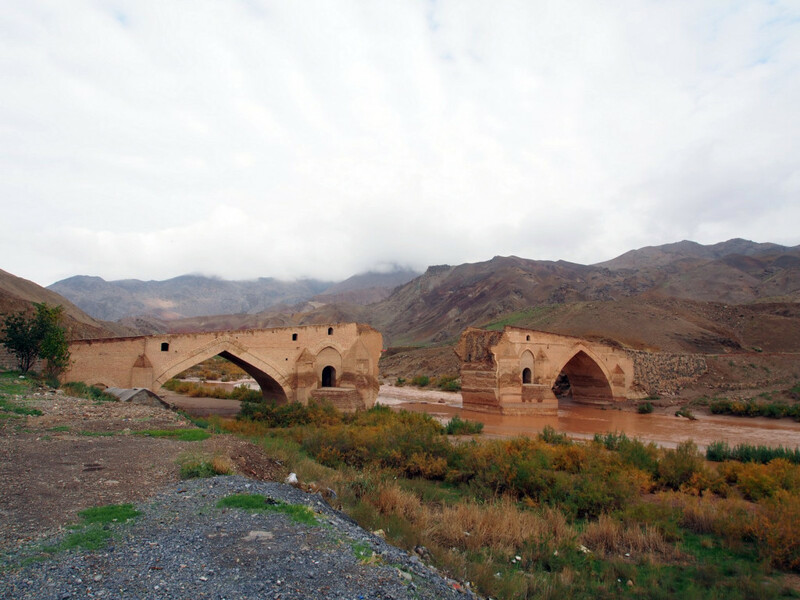 We cut our losses, having had no more than a few short glimpses of the sea, and almost froze recrossing the mountains towards Zanjan. 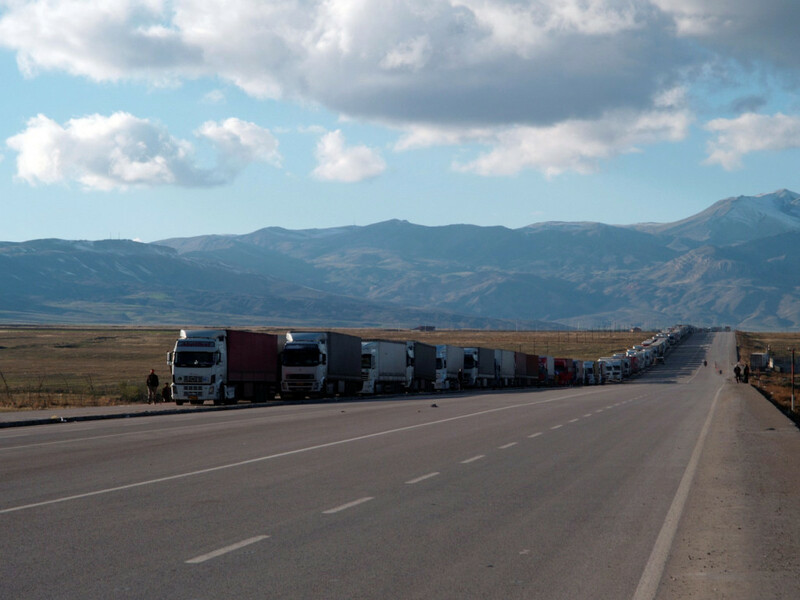 Throw in a flat tyre in the middle of nowhere, and being stopped and held for a few hours by fairly useless traffic police for no apparent reason, and we were feeling pretty frustrated. 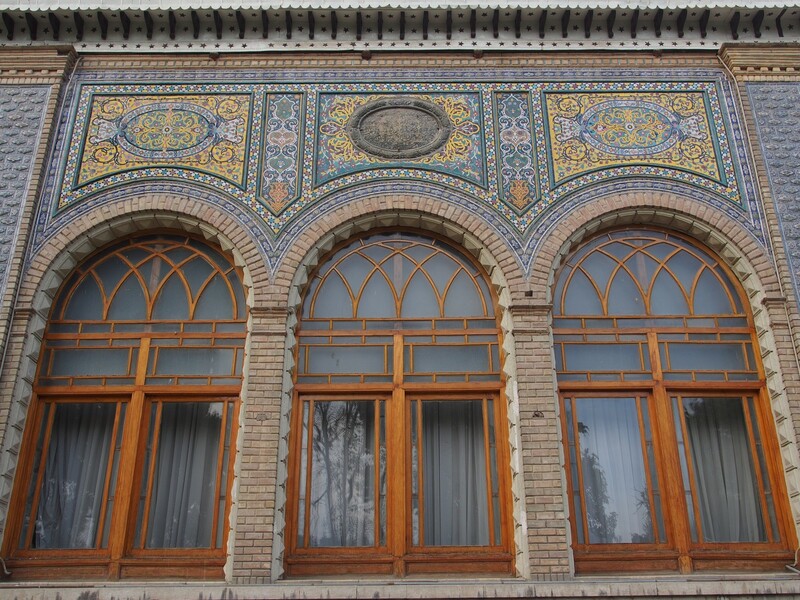 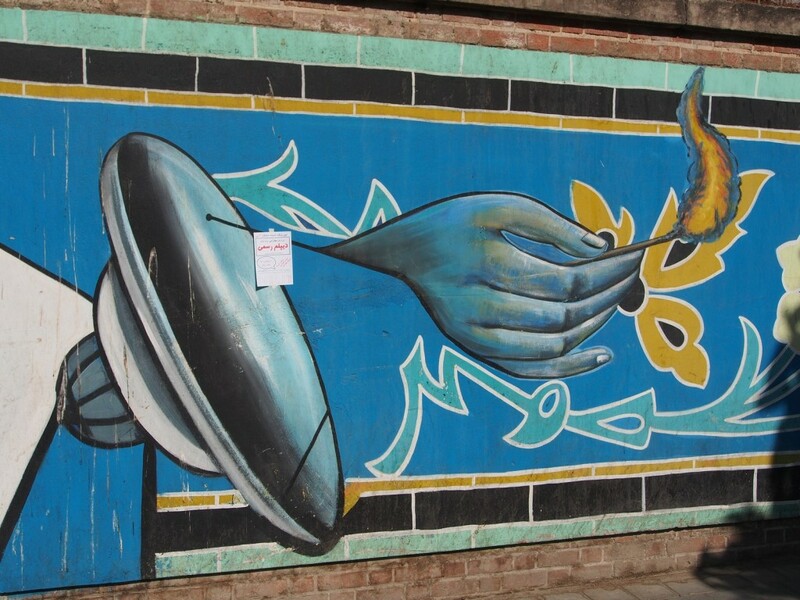 We pushed north to the last major city in Iran, Tabriz. 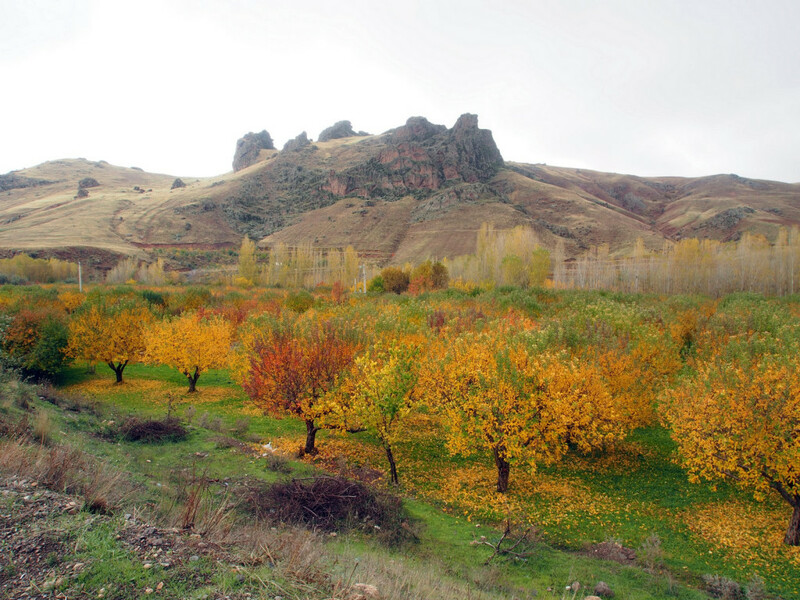 Freezing cold temperatures (even when it wasn’t raining) made riding moderately unpleasant, but the scenic autumn landscape helped. 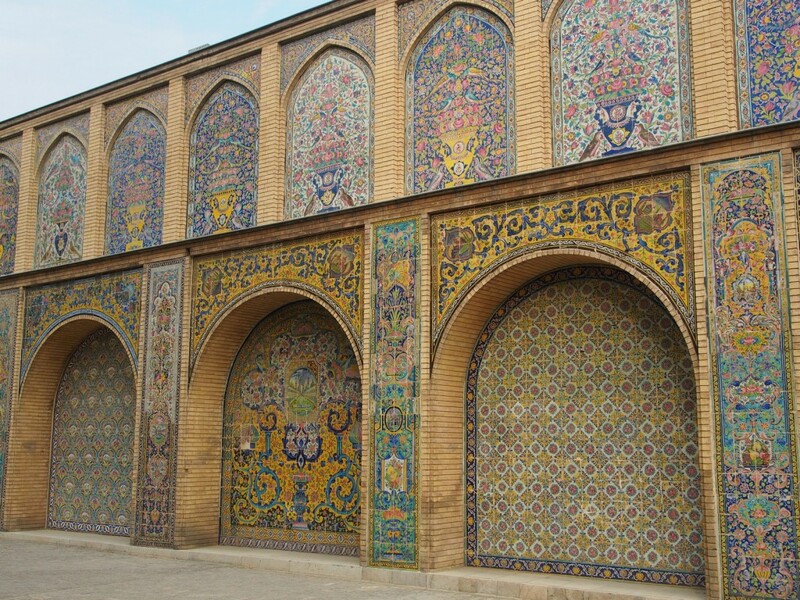 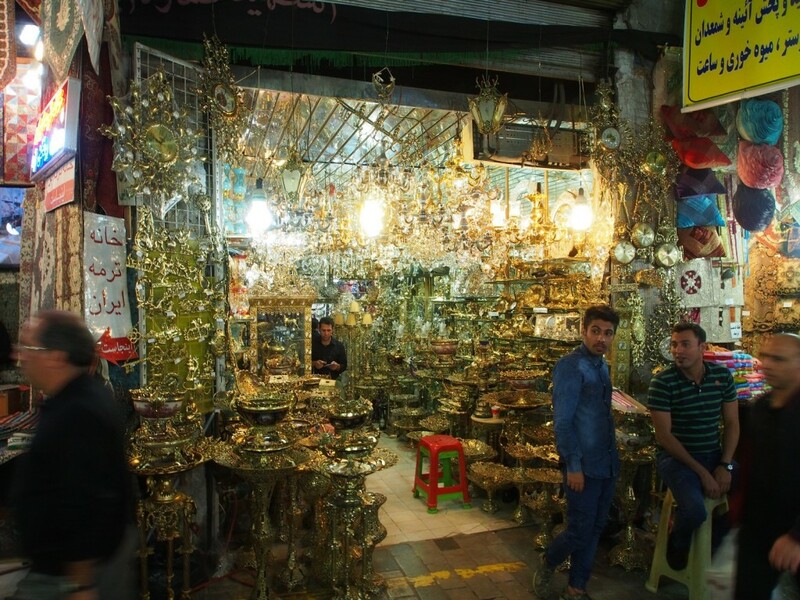 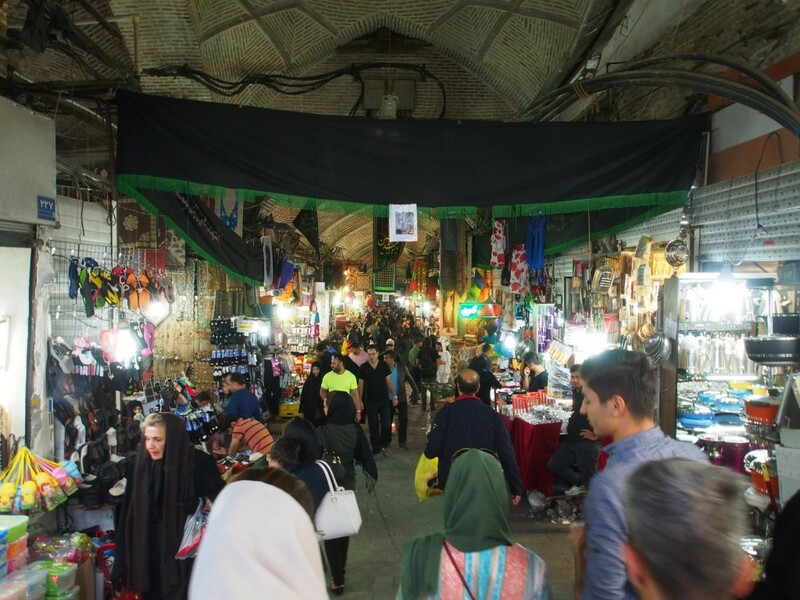 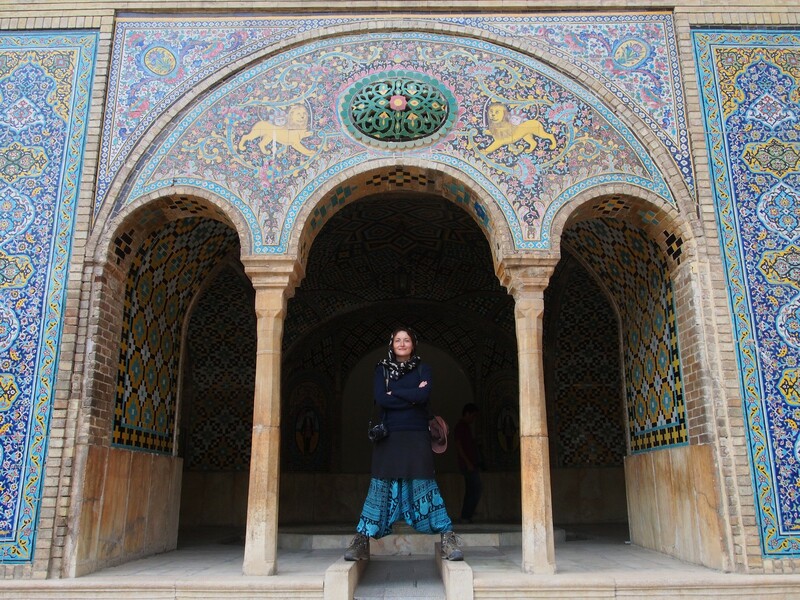 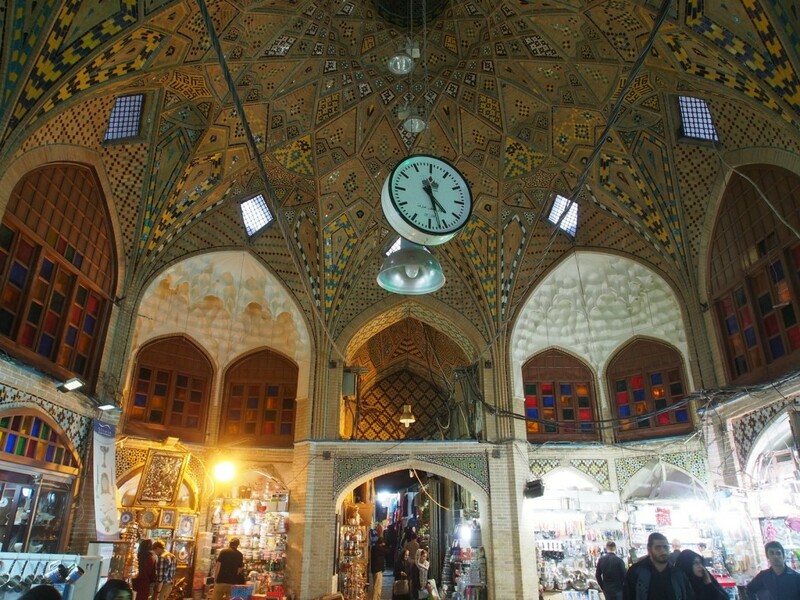 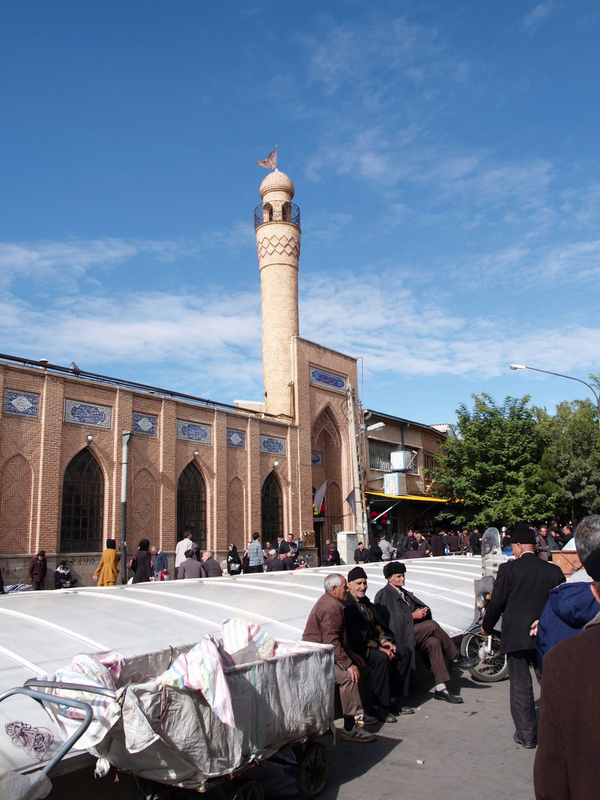 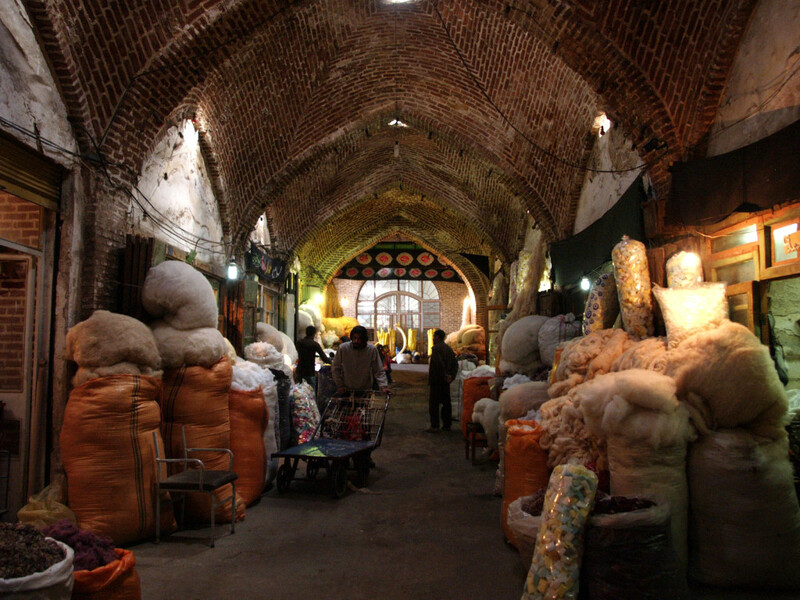 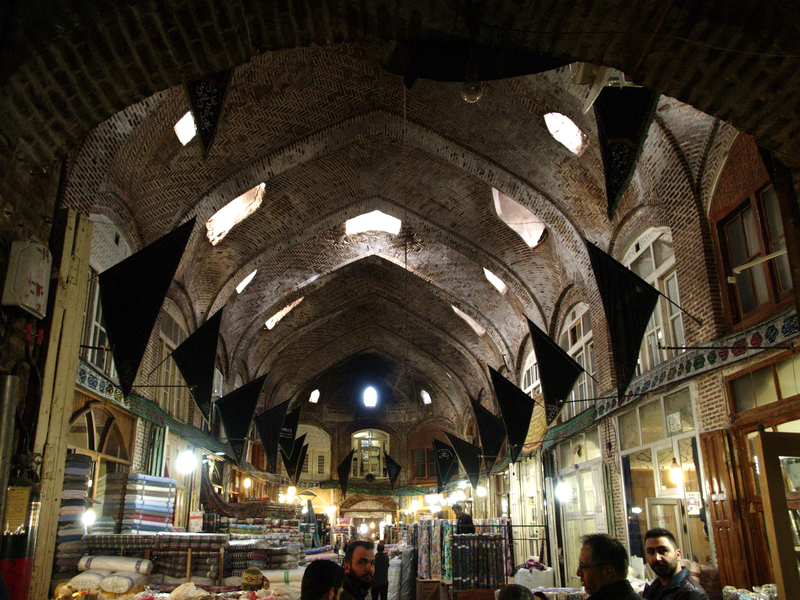 In Tabriz is another ancient market, but this time with almost no tourists. 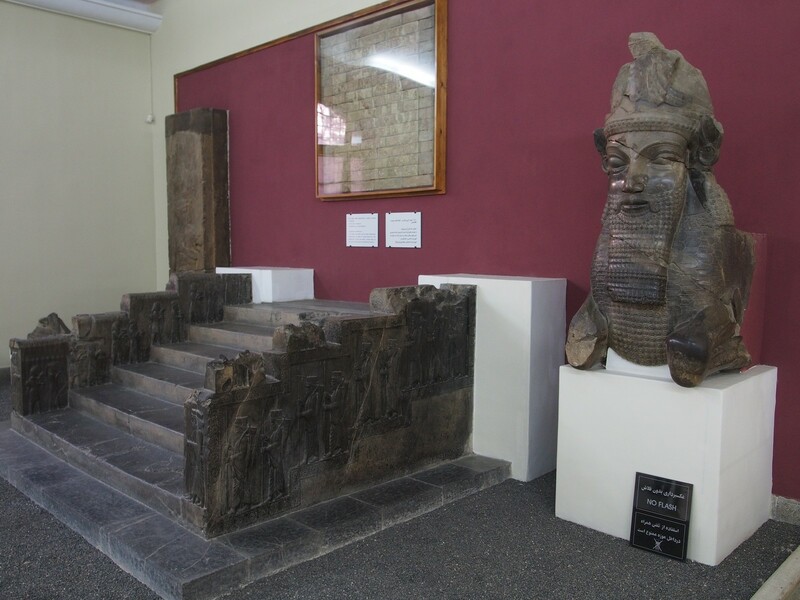 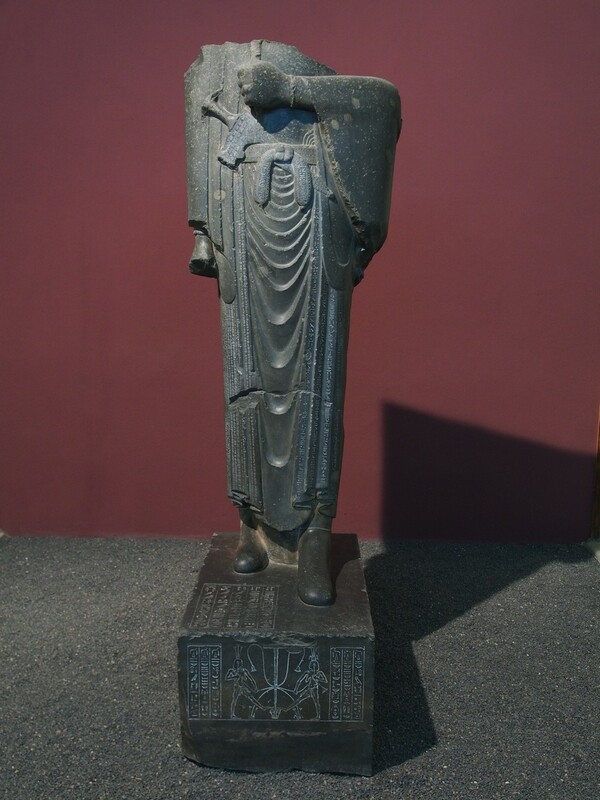 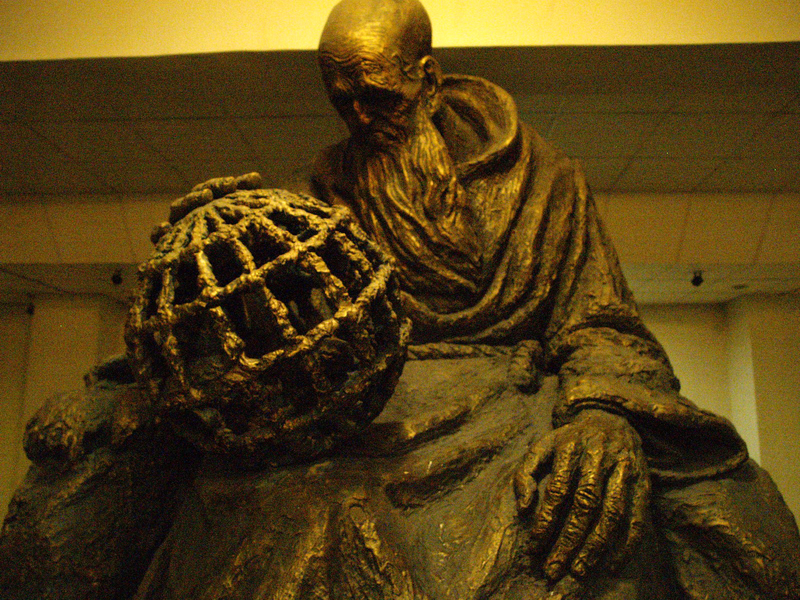 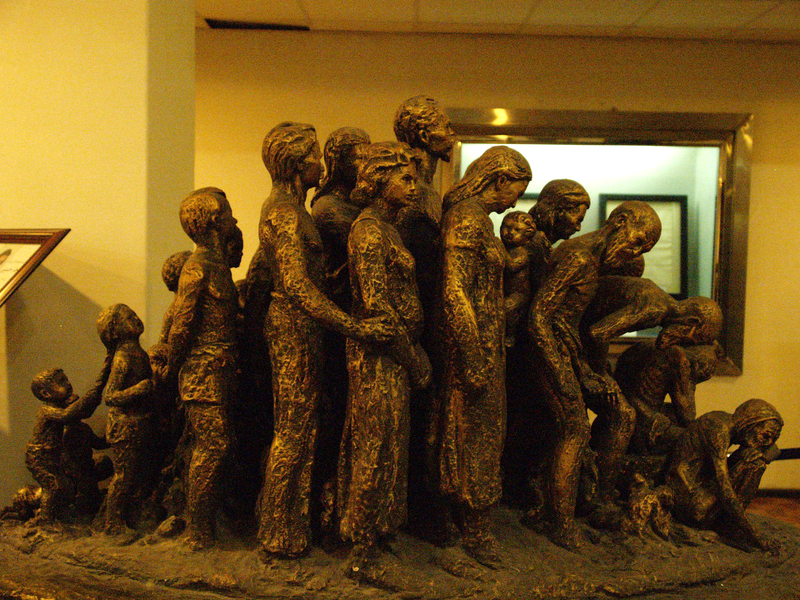 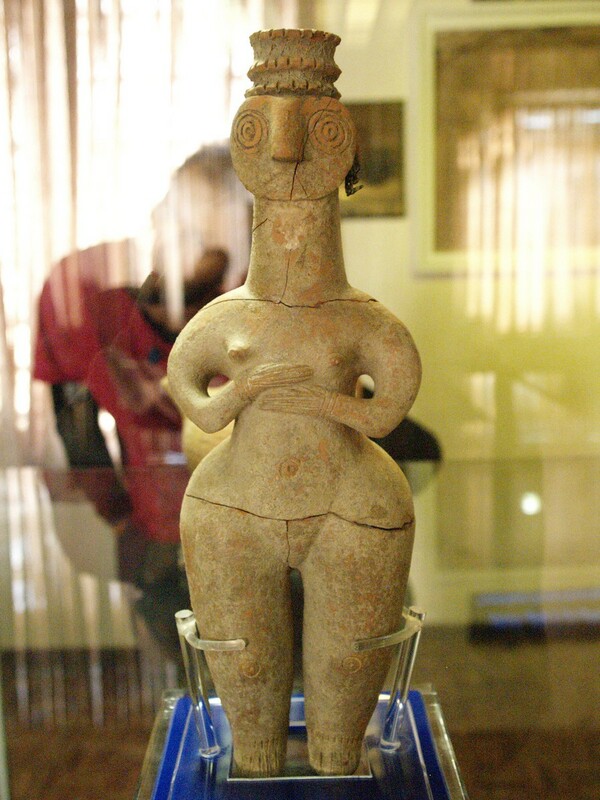 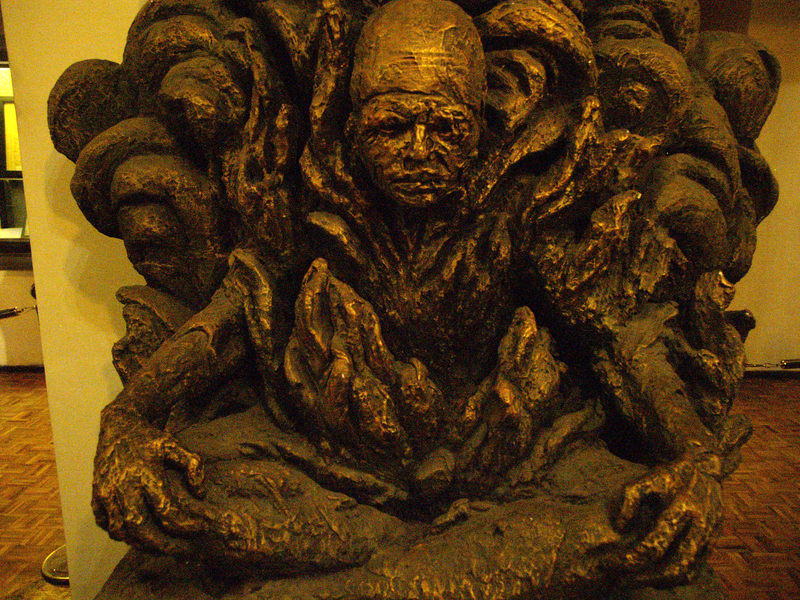 The nearby museum has some interesting ancient artifacts, and a collection large bronze statues in the basement. 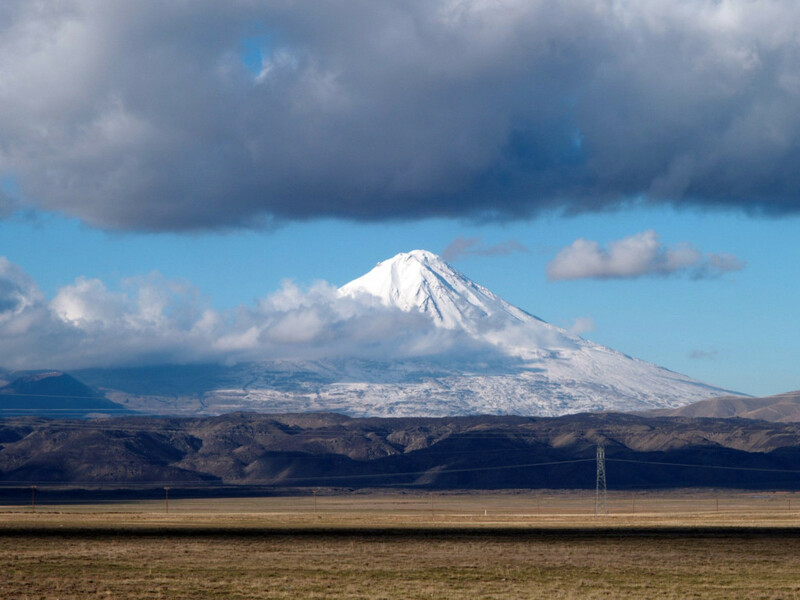 We pushed on the border with Turkey, passing lines of trucks dozens of kilometres long, and passed the border promptly – with the legendary Mt Ararat looming in the distance.